Department of Justice (DOJ) Office of Inspector General (OIG) officially condemned certain activities by the U.S. Drug Enforcement Administration (DEA) this month. 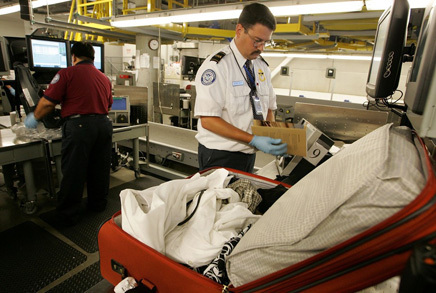 DOJ’s Inspector General investigated a report that the DEA had recruited a Department of Homeland Security’s Transportation Security Administration (TSA) security screener to search bags for cash that the DEA could seize. In exchange for the lead, the TSA screener was promised a portion of the seized cash as a kickback. This kind of covert arrangements shines the spotlight on the controversial practices associated with civil asset forfeiture, which misdirects law enforcement priorities from identifying security threats to policing for profit. Civil asset forfeiture allows law enforcement officials to seize a person’s property without obtaining a conviction or even charging the owner with a crime. State and federal agencies are obtaining hundreds of millions of dollars through seizures. Law enforcement is able to keep that property, use it to pad their budgets and pay improvised “finder’s fees” to the confidential sources for tips leading to the seizure. A 2015 OIG report found that from 2009 to 2013, the DEA seized $163 million in 4,138 individual cash seizures. Many of those cases were contested and later overturned. Inappropriately seized cash had to be returned in 41 percent of contested cases — for a total of a whopping $8.3 million. The DEA also came under fire in recent cases that involved agents seizing cash from airline and train passengers, and in some cases, allegedly shaking them down. In some instances, DEA agents approached airport passengers at the gate (after they passed through TSA security screening), claiming that they were conducting a “secondary inspection.” Some passengers can be targeted for aggressive questioning and a potential seizure simply for “pacing nervously.” If the individual voluntarily responds to questions, that is considered a “consent encounter” by the DEA Interdiction Manual and does not implicate the fourth amendment. The DEA’s controversial “confidential source” procedures led the DOJ to conduct an audit, while noting the agency’s “uncooperativeness” with the investigation. The audit found that the DEA used high-risk individuals as confidential sources without the appropriate level of review and oversight. These categories include leaders of drug trafficking organizations, lawyers, doctors, clergy, public officials, or journalists. The DOJ IG audit reiterated that using such individuals as confidential sources poses an increased risk to the public. According to the investigation, the DEA utilized over 240 confidential sources without an appropriate level of review, thus creating a significant risk that improper relationships between governmenthandlers and sources could be allowed to continue over many years. In some cases, the DEA continued to use individuals who were involved in unauthorized illegal activities, while they were under investigation by federal entities. The DOJ IG audit determined that the DEA was providing monetary benefits to confidential sources, yet had not established a process or any controls regarding such financial awards. During the 1-year period from July 1, 2013, through June 30, 2014, the DEA paid 17 confidential sources or their dependents benefits totaling approximately $1.034 million. In some cases, the DEA has been paying such benefits since 1974, without proper accounting for the disbursement of funds. In one case, the deceased informant’s family continued to receive benefits from the DEA since 1989, for a total of over $1.3 million received by that one particular household. The DEA paid an Amtrak informant nearly $1 million over two decades to provide them with passenger information that was already available to the agency. Numerous cases have arisen involving innocent Americans who had their property seized by the DEA at transportation hubs. At the same time, TSA agents were smuggling cocaine using their official positions. Significant taxpayers’ resources are being expended without appropriate review or oversight – ironically, meant to separate the same taxpayers from the cash they may be legally carrying.